Stretch nearly any meal with our quick Pasta Rouge, a simple dish made with pantry-ready ingredients. Want a quick and easy way to stretch a meal with pantry-ready items? Look no further than our Pasta Rouge! 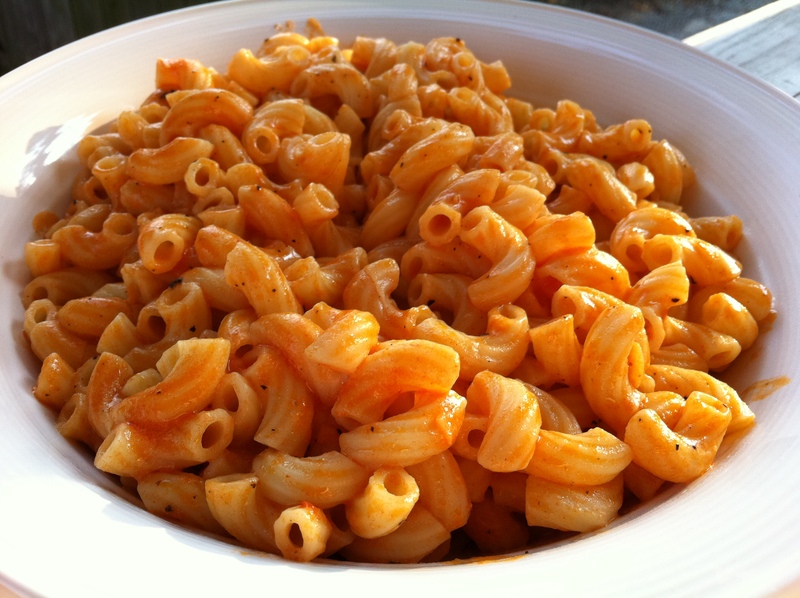 Using elbow macaroni, tomato paste, red pepper flakes, garlic and cream, this dish is tasty and ready in minutes. It is light enough to serve alongside poultry or fish and perfectly complements nearly any meal because its subtle flavors are satisfying without being overpowering. Bring a pot of water to a boil; add a pinch of kosher salt. Boil the pasta according to package instructions and drain. In a small, deep skillet, add 2 tablespoons olive oil, garlic and red pepper flakes. Stir for 30 seconds and add the tomato paste. Continue to stir for 2 minutes and stir in the milk. Simmer until slightly thickened, about 3—5 minutes. Toss the pasta in the sauce to coat. Serve warm. This recipe is so simple, cheap to make and really yum. I used soy milk instead and it turned out great. Thanks for posting. I’m thankful that for all my food weaknesses, Italian isn’t one of them!Love your pretty, pretty blog! Thank you for the compliments. We work hard to make this blog attractive, so we’re delighted that you love it. Also, as you can tell, we love Italian food. Be sure to check our Food page for other tasty recipes from other cuisines.